Los Angeles teachers’ demands have moved away from bigger raises and toward more funding to alleviate deep education cuts. But what would constitute victory for their union? For 21 months negotiations have ground on between UTLA and the second-largest district in the nation. (The Los Angeles Unified School District enrolls 640,000 students.) The more nuts-and-bolts issues on the table include union demands for a 6.5 percent pay raise, a limit to class sizes (that can now hover around 38 pupils per classroom), and a push for more support staff such as nurses and librarians. A walkout by the Los Angeles union (whose 33,000 members include librarians, student counselors and other support staff) would have a recent, successful precedent. Against great odds, Chicago teachers won a seven-day 2012 strike, which became a model that transformed the school-community relationship and how teachers interact with parents. That strike was launched after a careful grassroots effort to build support among parents and the Chicago union; it is cited by Ken Jacobs, chair of the UC Berkeley Labor Center, as a national example. The issue in Chicago was Mayor Rahm Emanuel’s effort to close schools and the union’s push to keep them open. This was different from the situation in L.A. and in states along what Jacobs calls the “red thread”– West Virginia, Oklahoma and Arizona, where the teachers joined with parents to oppose the underfunding of education that has occurred since the 2008 recession. Still, Chicago offers potential lessons for Los Angeles teachers. The Chicago teachers union would later reach out to teachers in West Virginia, Oklahoma and Arizona, sharing their members’ experiences, he said, adding that, in organizing for a potential strike, the traditional big fear is that the parents are going to turn against the union. That didn’t happen in Chicago because of mindful base-building and teachers’ connections with their students and their parents. That lesson hasn’t been lost on UTLA. 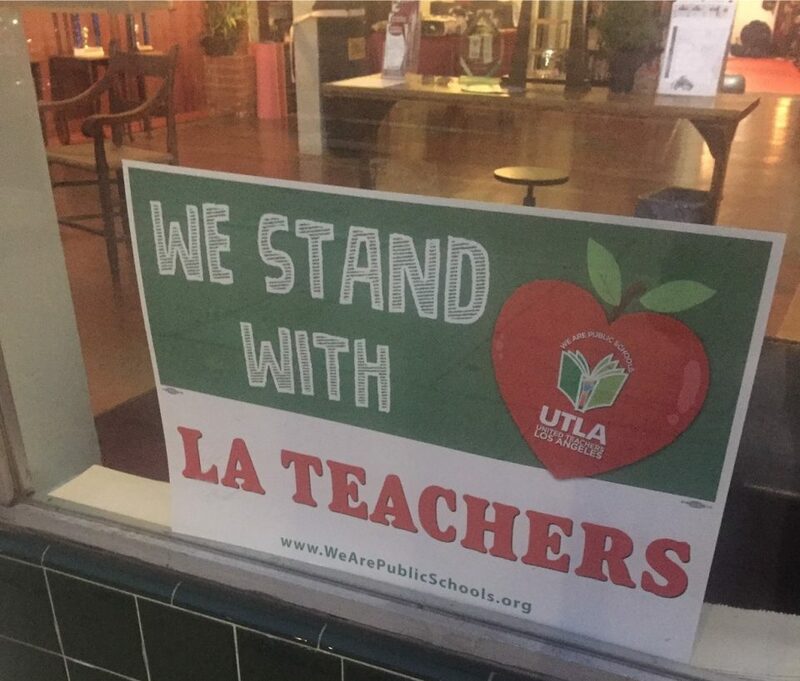 In Los Angeles signs have popped up in the windows of local businesses declaring, “We Stand With LA Teachers,” and local parent groups have banded together to support the educators. What would constitute “victory” for Los Angeles teachers?